This area was known locally as 'The Bauxite'. Not a lot is recorded about this 'British Aluminium Co' apart from it produced Aluminium Hydroxide from the ore known as 'Bauxite'. A lot of waste known as red mud was a by-product of the process & it was dumped on the site producing hillocks/mounds of this red mud. It was fenced off to keep people off it. Probably the "Tribal"-class destroyers HMS Afridi and Cossack, which were launched on 8th June by Vickers-Armstrongs. They would be about to start fitting out, but this work has yet to start. St Cuthbert's Vicarage situated out in the countryside away from all the pollution around the actual Church. The pollution was from all the coalfires in the homes of the people, plus fumes from the Chemical works, the Sulpher & Copper Works etc. Hebburn Railway Station. The photo is from my FREE www.oldtyneside.co.uk website. The Newcastle to South Shields railway line. 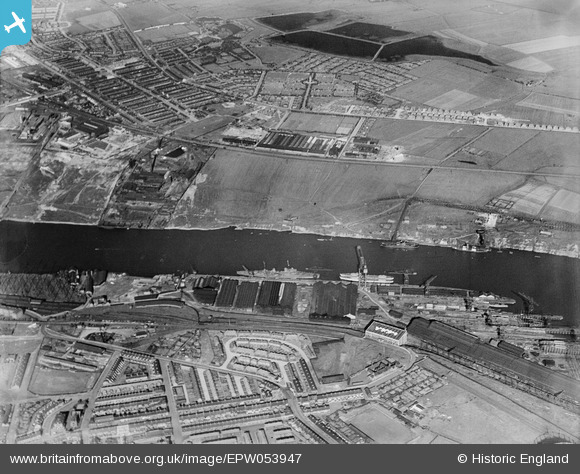 This is roughly where my photo was taken of the Staiths & the Staith House Inn. A few yards further along was the Tennants Arms pub where I have been told sailors met local good time girls. The manager of the Staith House didn't allow that behaviour so it was probably a lot quieter in his place. This was the Tharsis Sulpher & Copper Works reservoir known locally as the Copperworks Pond. When Tharsis pulled out of the town that 'Pond' was left unfenced & was a magnet for local children. I myself fished for stickleback in it as a 8yr old. The brick sides of it sloped steeply into the depths so it was impossible to 'plodge' or you'd just slide into the water. About 1950 ish a lad called Colqhoun who was my age drowned in it. In previous years other children from the close by Newtown houses also drowned in it. Its difficult to see on this aerial view but there was a Pumphouse at the edge of the 'First Lake'. Here it is on my photograph taken from my website www.oldtyneside.co.uk The lakes & pumphouse area were our playground in the 1950s as I lived just 200 yds from the lake. This 'Pin' is on the field where in about 1950-51 Coniston Ave, Windermere Cres, Grasmere Rd & Thirlmere Court were built. My parents moved into Grasmere Rd 1953 & it was a brand new Council House which we thought was marvellous. Previously we'd lived in an old 1800s upstairs Flat in Lyon St with a toilet in the back yard. My photo shows my late sister Marian Dunn on Campbell Parkk Rd with Coniston Ave/Windermere Cres behind. Behind the camera was the First Lake. Only remaining landmark, yellow hammerhead crane. Most likely. Outside chance it is "Newcastle" but she had completed by this point. Vickers Armstrong Naval Yard, Walker. Six storey office block. Clegg House farm was close to this identification flag. There was also a fresh drinking water well here & called Clegg Well. The land just before it is where Clegwell School & playing fields were situated in the 1930s. Hebburn Park that once along with the lakes belonged to the Carr Ellison Family who owned land & pits in the town. Sir Humphrey Davy stayed at Ellison Hall & used bottles of gas from Hebburn 'B' Pit to test his invention 'The Davy Lamp'. This saftety lamp saved thousands & thousands of lives worldwide because other countries were experiencing methane gas explosions in their coal mines. The empty derelict land left by United Alkali's Chemical Works after demolishing. The works had started off as Tennant's Chemicals in the 1860s. Hebburn's 4 man made lakes that the Ellison land owning family had made in the mid to late 1800s. Tharsis Sulpher & Copper Works.